THE SPY BY PAUL COELHO – Books, Books and More Books! The story of the infamous Mata Hari. Was she the spy she was accused and executed for being? Or simply a woman wanting to live life on her own terms? Either way it’s the language that is used that made this such a good read. The story is told through the last letter she wrote before her death, telling her life story. Although by the time she died I’m not sure she even knew what the truth was. There is no doubt that she was an accomplished liar. Her one flaw that turned out to be part of her undoing was that she didn’t see that the people she was playing for her own gain, were also playing her. There is no loyalty when the armies are marching into your country. No one would be there for her at the end and that was sad but it really was her own doing. There were some very profound truths in here. His books always stick with me long after I have read them. Now I wait for the next one! I am currently reading his book, The Zahir. I think because I read The Alchemist first, all his other books leave me a bit, wanting. But, he is an excellent author and I keep going back to his books, so I must be getting something fulfilled by reading his work. She’s always fascinated me. I’ll have to try to get this book! It’s at the library. Came out Nov if last year. I’m a wanted woman at 3 of the local libraries. I’ll have to send Mr. C! This sounds really interesting to me. I’ll have to check it out at the library. Is this a true story? I missed that. It is actually from her own letters. They are unsealing a lot of WWI documents now. So he filled in some areas. She wrote a letter to her lawyer before her execution and it is true. Thanks. Now I’m really interested. 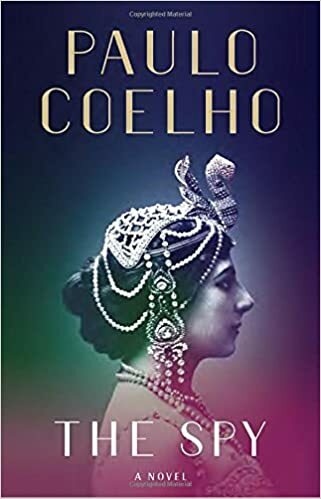 Oh, I didn’t know that he wrote a book about Mata Hari. I recently learned about her and found her story to be fascinating! Would be nice to learn a little more. Paulo coelho novels are just amazing !! This one really sounds interesting !! Thank you for the link! I’ll be sure to read this. I’m fascinated with all things WWI. Me too. I really loved researching her!